A Very Low Frequency transmitter you can tune in on your PC. Most people have heard of or may remember UHF or VHF from their old televisions. They stood for Ultra High Frequency and Very High Frequency, and because of their high frequencies they made excellent wavelengths on which to broadcast complicated messages such as television signals. Feskekôrka - The "Fish Church"
A Gothic-inspired fish market is Gothenburg's best place to find loaves and fishes. Such is the case with the Grimeton VLF Transmitter. 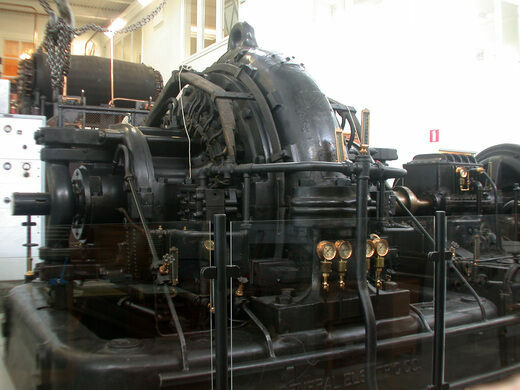 Until the mid 1950s, it was used for transatlantic transmissions by the Swedish Navy to their submarines. Though the Swedish Navy gave up its use, it was in such excellent condition, it was declared to a technical monument. One of the things that makes this transmitter unique is that the Grimeton VLF Transmitter is the only transmitter in the world that uses a rotating machine instead of tubes or transistors. Built from the only working Alexanderson Alternator in the world. In the simplest terms rotating magnets turn at such a rate the the machine generates a frequency of 17.2 kHz. The antenna of the transmitter consists of six wires, which are fixed on six 127 meter tall grounded towers. On special occasions, like Alexanderson Day - first Sunday of July each year, honoring the inventor of the alternator Ernst Fredrik Werner Alexanderson - the transmitter is put into service and Morse messages are broadcast. There are multiple ways to receive them. The easiest and cheapest for most people is the use of a PC with a soundcard and FFT-analysis software. As antenna a coil of several hundred windings connected to the soundcard is used. With such equipment, it should be possible to receive a transmission from this unusual and unique machine throughout Europe. Hundreds of mossy stones engraved with bits of philosophy, literature and random musings. Take a schvitz just like an infamous Soviet dictator while his unblinking eye looks on. Iron Age grave stones and Viking burials a short drive from Gothenburg.